Remember sniglets from back in the 80s? Words for those everyday things or events that formerly didn’t have words for them? There is still a need for such a service. Allow us to present you with QUINBLOITS – kind of like sniglets that are all grown up. Or, maybe ‘senior sniglets’ is more accurate. 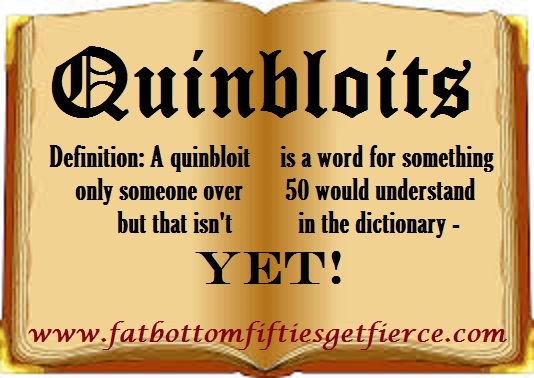 However you want to compare them, quinbloits are words that only people over 50 will truly understand and appreciate. And yet, as important as each quinbloit is, none of them are in the dictionary. Yet. We figure once we start using them, these much-needed words will eventually find their way to Webster’s finest. Today’s Friday Five introduces our very first quinbloits – never seen anywhere before! We’re so glad you’re here to share this monumental moment with us! Roomember – to find yourself standing in the middle of a room trying to remember what you went in there to get. Blotzwalk – the act of re-tracing your steps until you hit the event that triggers your memory about why you entered the room. NOTE: When the memory is triggered, you should immediately write it down before heading back to the location you previously roomembered. Groots – the amount of gray in your roots that it takes to motivate you to recolor your hair. Pilligation – the act of filling up one’s pillbox for the week – generally performed on a Sunday evening. Related term: Tripilligation – the term used when the pillbox has 3 rows for those who take pills three times a day. NOTE: When a pillholder has 21 rows, it is now a mega pillbox and the act of filling it known as a minipharmpilligation. Schmuckal – The decision that needs to be made when the phone rings just as your TV show ends and, while you’re talking to the caller, the theme from Wheel of Fortune blares in the background. Do you explain hurriedly that you’re not actually watching that geezer-fest or hope they won’t hear it if you don’t call attention to it? NOTE: A coschumckal can occur when you hear “Wheel! Of! Fortune!” in stereo and both parties must simultaneously schmuckal. Our quinbloit dictionary is a work in progress that we are just getting started on. If you have a proposed quinbloit, please submit it to us in the comment section below or email it to us at fatbottomfities@gmail.com. And speaking of emails, please sign up for our free email notice subscription!